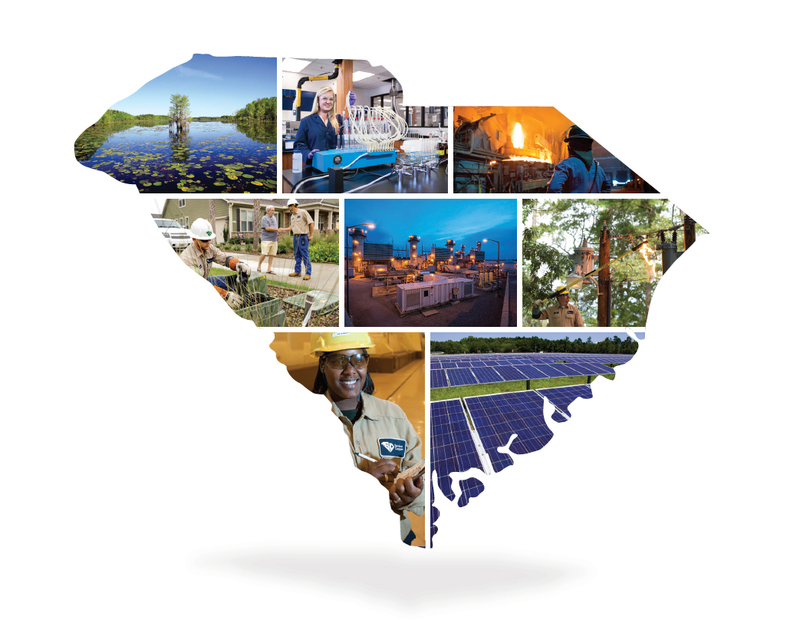 A major resource for improving the quality of life for all South Carolinians, Santee Cooper provides reliable and affordable electricity, clean and safe drinking water, environmental stewardship and programs that recruit industry and jobs. Santee Cooper is a public power utility owned by the state. Santee Cooper supports industrial recruitment with grants, loans, facilities or other provisions. Santee Cooper provides power, directly and through the state’s electric cooperatives and our other wholesale customers. Direct and indirect customers can buy Green Power generated by Santee Cooper biomass, solar and wind resources. Santee Cooper’s GOFER program collects used motor oil – 30 million gallons so far – and ultimately recycles it to make electricity. Our 1,650 full-time employees go home at night to 36 of the state’s 46 counties. 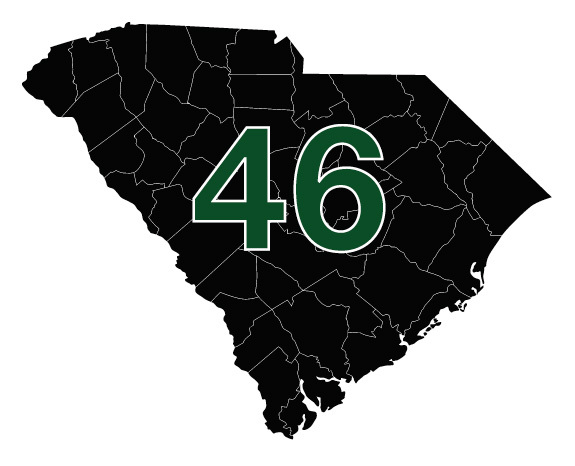 We work at Santee Cooper facilities in 17 counties. 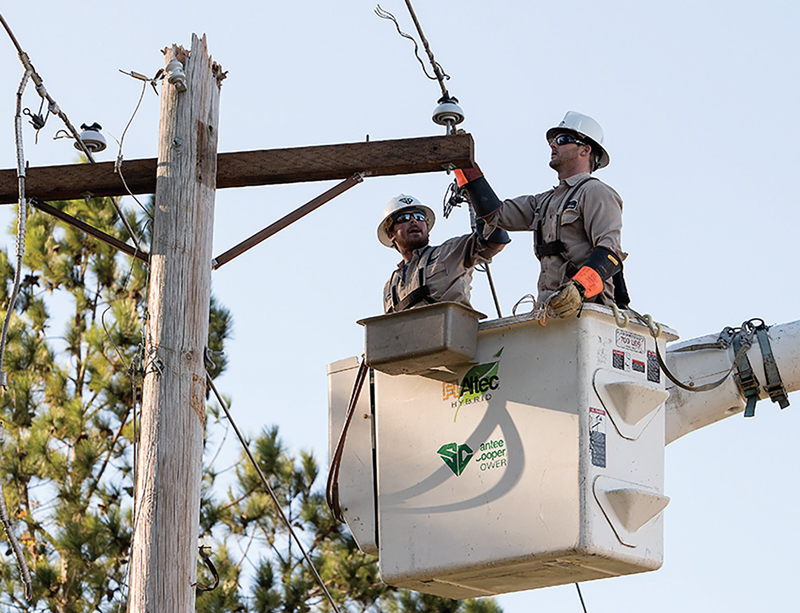 Santee Cooper employees deliver excellent customer service, reliability, safety and community outreach for the benefit of all the people of South Carolina. Santee Cooper is one of the top state agencies as ranked by the South Carolina Human Affairs Commission annual report on diverse workplaces. Roughly 95 percent of our customers are satisfied with Santee Cooper, year in and year out. We are significantly ahead of the national average on this measure. Our customers give us their highest marks for our low rates, our conservation, energy efficiency and renewable energy programs, our community involvement and our concern for the environment. We maintain transmission and distribution reliability ratings above 99.99 percent – that’s an enviable standard, and it means our customers are without electricity less than a half hour on average each year. We work hard at safety, and we’re really pretty good at it. Santee Cooper lineworker teams swept the American Public Power Association’s National Rodeo competition in 2017 and 2018. Santee Cooper hosted our first Lineworkers Rodeo in 1998 and was instrumental in helping the American Public Power Association begin a national Rodeo, too. These events promote safety in all line work, encourage camaraderie between our line crews and the electric cooperatives’, and celebrate teams and individuals who complete the intended tasks quickly while following safety procedures and requirements. Last year, Santee Cooper earned a First Place American Public Power Association Safety Excellence Award for large utilities with the lowest incident rates across all business operations. Santee Cooper recorded the fewest safety incidents in 2018 compared to any year since we started keeping records. Amount Santee Cooper employees have donated over the past 12 years to United Way campaigns in Horry, Georgetown, Anderson and the Trident area. Amount raised since 2011 for local charities in Berkeley County by Celebrate The Season, a holiday lights driving tour and festival hosted by Santee Cooper employee volunteers. Amount employees have raised for the American Cancer Society’s Relay for Life since 2001. Number of pints of blood employees have donated to the American Red Cross since 2000. Santee Cooper employees mentor students in math, reading and communication skills at 15 schools in our direct-serve territory: Berkeley, Horry and Georgetown counties. Santee Cooper provides many educational programs, materials and opportunities for students and educators to learn more about electricity, electrical safety, environmental stewardship and more, helping to educate our communities’ future leaders. More than 2,000 South Carolina K-12 teachers and administrators have completed our Energy Educators Institute, a 32-year-old graduate level course that explores the scientific concepts of energy, impact on the environment, economy and society. 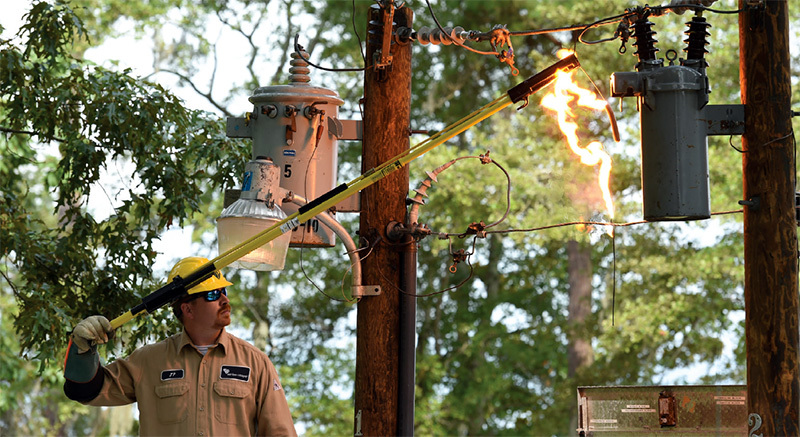 Santee Cooper’s mobile PHAD unit demonstrates the intracacies of power line safety by cooking a hot dog. Through business education partnerships, hundreds of Santee Cooper employees have mentored grade school students in reading, math and communication skills in 15 schools in Berkeley, Horry and Georgetown Counties. Our generating station tours introduce students to the basic process of generating electricity and to STEM careers. Our mobile PHAD unit provides an engaging, high-energy demonstration of the hazards of electricity and lightning to students, first responders and other groups. Each year Santee Cooper employees participate in numerous career days throughout Berkeley, Georgetown and Horry schools discussing the importance of education and career choices. 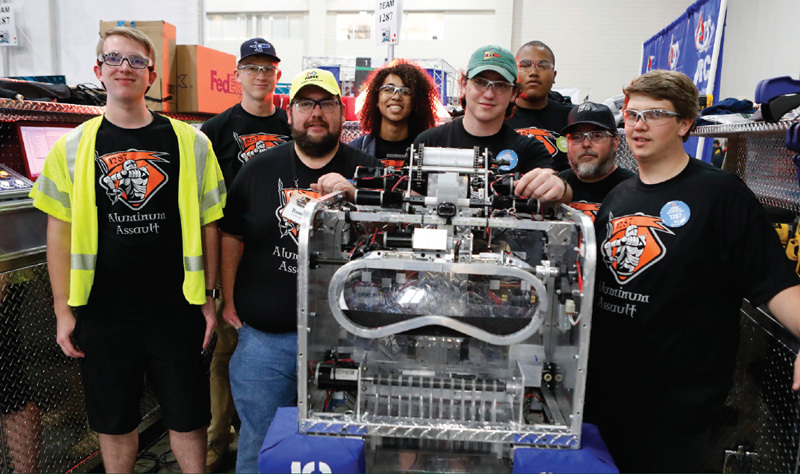 Employees throughout the company serve as mentors for FIRST Robotics Teams, Mock Trial, Technology Student Association and other organizations to help students develop critical thinking, team-building and presentation skills. A FIRST Robotics team in action during competition. Santee Cooper offers tours of the Lake Marion and Lake Moultrie water plants to show how water is treated and moves from the lakes to the home and business pipes of more than 150,000 Lowcountry residents. Students observe water quality testing in the laboratory and see the process for treating more than 36 million gallons of water per day. Santee Cooper provides effective, engaging, curriculum-based publications to teachers throughout the state free of charge. e-SMART Kids is our website that educates children about electrical safety, energy efficiency and sustainability. It has videos and interactive games, as well as tips on how to stay safe around electricity and how to use water wisely. Launched 12 years ago, Santee Cooper’s Green Power Solar Schools initiative grows interest in the environment and renewable power generation by providing a solar array, science lab materials and access to monitor the array’s solar energy output to 6th grade students at schools across the state. Today there are 28 Green Power Solar Schools across the state, many of those a partnership with the state’s electric cooperatives. 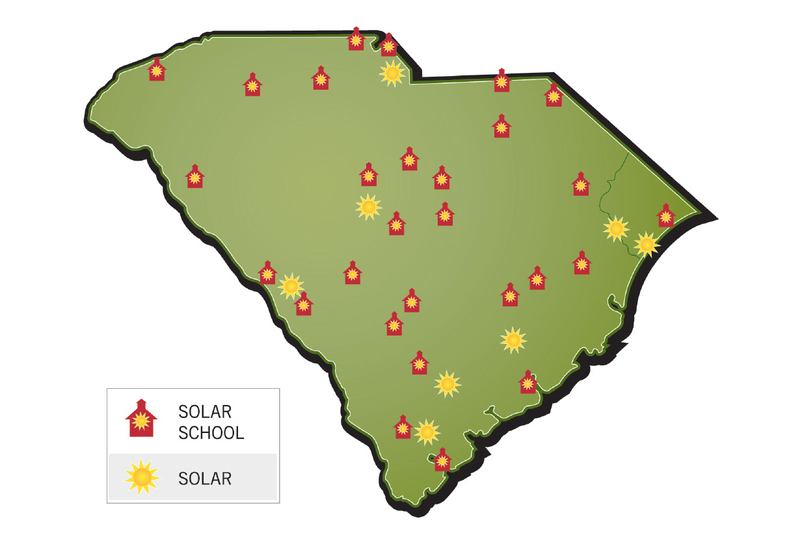 In 2007, Hilton Head Middle School became our first Green Power Solar School in the state. We provide a 2-kW solar array at each middle school, which is connected to the internet for real-time and historical tracking of generation. Santee Cooper also provides a 6th grade energy curriculum that meets state education standards, and materials for hands-on science labs on renewable generation. We have trained 165 teachers on Green Power Solar School curriculum and lab exercises, and these teachers in turn have taught the material to more than 75,000 students. In July 2006, Santee Cooper introduced solar power to the state’s electrical grid when we donated Green Power solar pavilions to Coastal Carolina University. We have also donated solar resources to the Technical College of the Lowcountry, the Applied Research Center in Aiken, Trident Technical College (Berkeley Campus), and the Center for Advanced Technical Studies in Chapin. Power Associates students Brenda Lee and Alfie Pineda. Santee Cooper’s Power Associates Program is a competitive scholarship program that prepares high school graduates for rewarding technical careers in the electric utility industry. During this two-year program, students earn a technical associate degree and a competitive wage while gaining hands-on experience by working in a generating station or electrical distribution area. We teamed up with Clemson University and Coastal Carolina University in our pioneering wind mapping along South Carolina’s coast. In addition, we donated a transformer to Clemson University’s Wind Turbine Test facility in North Charleston for use in grid simulation research. Santee Cooper and the state’s electric cooperatives announced a $5 million gift in 2009 to fund clean coal research at the University of South Carolina. The money was split between an endowment and the salaries of researchers to begin the work. Wofford College and Santee Cooper collaborated for several years on a lecture series focused on sustainability and energy issues for the college’s Glendale Shoals Environmental Studies Center, beginning in 2009. Exploring the power of electric vehicles during an internship rotation. From 1990 through 2017, Santee Cooper has hosted nearly 300 college students through our Environmental Intern program, a competitive internship involving nomination of candidates by state and federal elected officials and the Electric Cooperatives of South Carolina. Interns rotate through nine areas (three areas each) offering Santee Cooper environmental stewardship programs, to learn about the utility’s role in balancing generation, transmission and distribution of electricity with the opportunities and challenges of renewable energy and other matters. Areas of rotation include Air & Water Quality, Analytical & Biological Services, Coal Combustion Products & Waste Management, Investment Recovery, Property Management, Old Santee Canal Park, Renewable Energy, Right-of-Way Management, and Vector Management. This 195-acre historical and natural jewel in the heart of Moncks Corner features an Interpretive Center, theater and classroom, and hosts schoolchildren from across the Lowcountry for field trips and educational seminars. Santee Cooper financed construction of Old Santee Canal Park, which opened in 1989, and we assumed ownership and operation of the park in 1999. The park offers environmental programs that emphasize the vast diversity of plant and animal life native to the area and found throughout the park. History and other educational programs offered include tours of the Stony Landing House, a circa-1843 farm house with a rich history entwined with the Lowcountry, and exhibits in the Interpretive Center chronicling the area as far back as 4000 B.C. The park features four miles of boardwalk and hiking trails along Biggin Creek and parallel to the Tailrace Canal. There is also a large floating dock that provides access and recreation to boaters, kayakers and canoers. Old Santee Canal Park is also home to the Berkeley County Museum and Heritage Center. Old Santee Canal Park is popular for canoeing. Santee Cooper serves more than 2 million South Carolinians with both competitive rates and superior customer satisfaction and reliability ratings. Santee Cooper rates are up to 30 percent lower than state and national averages depending on customer class. These low rates are essential in meeting existing customer needs, attracting new industries and jobs. Santee Cooper’s residential customers posted a 91.8 percent overall satisfaction rate in 2018, above the national average. Customers scored us highest for keeping outages to a minimum and showed increasing satisfaction with our care for customers. Our customer satisfaction results are consistently higher than the national average of 89.9 percent overall satisfaction. Santee Cooper’s distribution system reliability ranks in the top 10 percent in national benchmarking surveys. 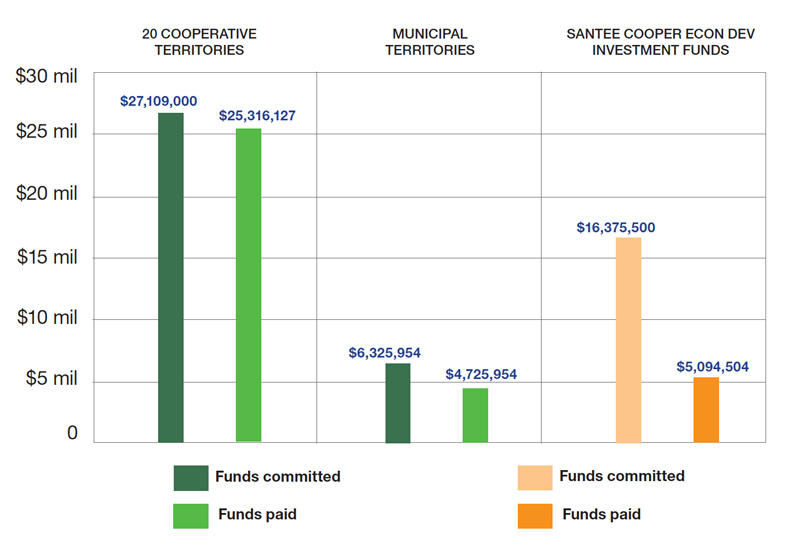 City of Myrtle Beach heralds a “first of its kind Underground Facilities Franchise Fund” in 1999, in which Santee Cooper matches a portion of the city’s yearly franchise fee and the combined money is used for construction and installation of underground utilities. Matching funds help convert overhead to underground lines. Santee Cooper provides an around-the-clock Storm Center to customers, accessible by phone or online. This application lets customers report outages and monitor restoration. Santee Cooper also provides steps and tips to follow if a customer experiences a power outage. Once the outage is reported, employees respond as soon as possible and work to restore power to the home or business. In 2018 transmission delivery points averaged only 11 minutes without service and distribution customers averaged only 18 minutes without service. Santee Cooper generates electricity from four large base load facilities located across South Carolina, as well as from supplemental hydroelectric, peaking and renewable generating stations. 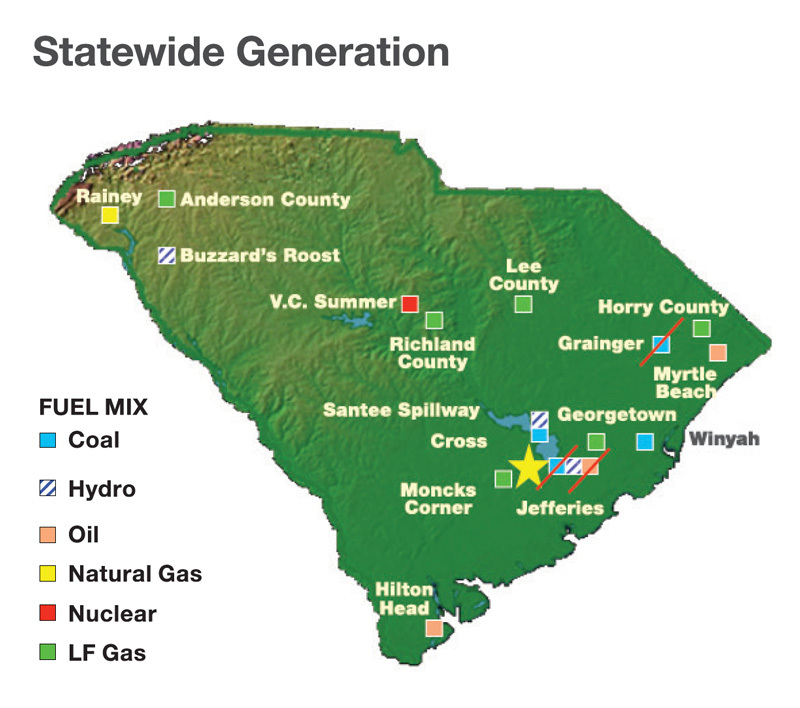 The base load generation comes from Cross Generating Station in Berkeley County, Winyah Generating Station in Georgetown County, V.C. Summer Nuclear Station in Fairfield County, and Rainey Generating Station in Anderson County. On Feb. 17, 1942, Jefferies Hydroelectric Station officially turned its first turbine for the first time. It represented the start of Santee Cooper’s electricity generation. Some 75 years later, Jefferies’ hydro units are still powering our customers. We refurbished two units in early 2017, achieving a 20 percent increase in generating capability in the process. Today we provide electricity from a mix of resources that includes hydro, coal, nuclear, natural gas and renewable resources. Santee Cooper effectively manages generation based on the most economic sources in order to provide reliable electricity to two million South Carolinians. We provided South Carolina electric customers with the first renewable generation in the state, in 2001, using methane gas generated naturally in landfills. We also introduced solar and wind power to the state’s grid, and we brought the first utility-scale solar farm to South Carolina. Our units perform: in 2013, Unit 1A at Rainey Generating Station ran for more hours than any other natural gas generating unit in the country, indicating the high quality of Santee Cooper’s workforce and maintenance processes. With Santee Cooper’s leadership, The Energy Authority was formed in 1997 as the nation’s first public power marketing alliance. 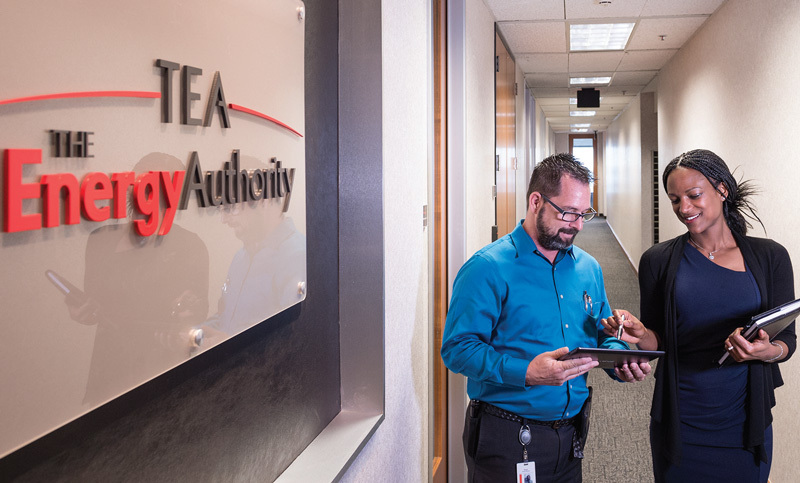 TEA continues to provide Santee Cooper and its other members with the ability to buy and sell power daily. That helps us better use Santee Cooper’s generating resources, which saves customers money. Our commitment to the use of emissions-reducing technology goes way back: Santee Cooper installed South Carolina’s first coal-unit scrubber, in the 1970s, at Winyah Generating Station. We have retired our oldest fossil stations. The existing fleet of coal units is fully equipped with environmental control technology that meets or exceeds federal and state regulations. A decade ago, 80 percent of our generation came from one fuel source: coal. 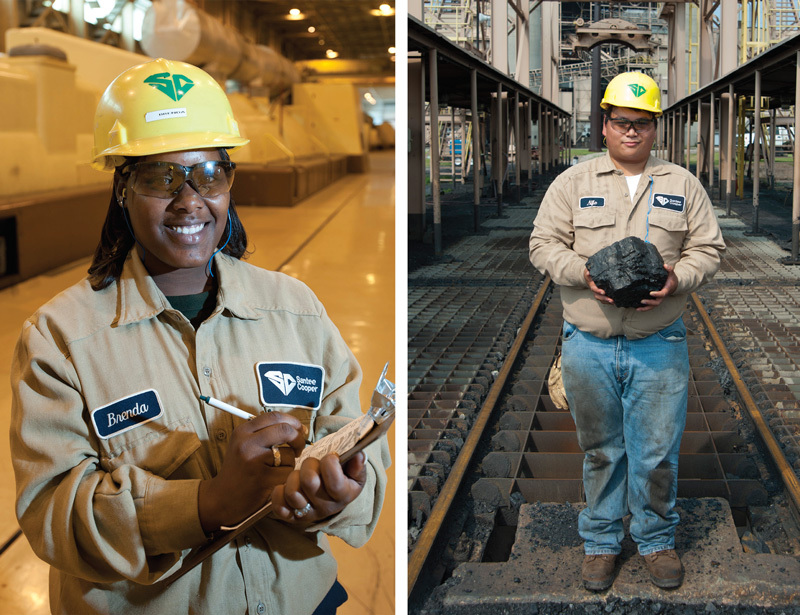 As environmental regulations and transportation challenges increased the price of coal, Santee Cooper worked to diversify our generation portfolio. That lets us save customers money by using the most cost-effective generation on any given day. In 2018, 46 percent of Santee Cooper’s generation came from coal units. In that same time period, we increased the use of our own natural gas units and purchased supplemental, low-priced natural gas-fueled generation. Santee Cooper introduced Green Power to the state grid in 2001, with the opening of the state’s first Green Power Generating Station at the Horry County Landfill. Today, there are six landfill-based Green Power stations. These stations capture methane gas, a potent greenhouse gas, and turn it into electricity. Green Power is a part of Santee Cooper’s renewable generation portfolio, which has more than 100 MW online or under contract including landfill gas, solar, wind and biomass. Santee Cooper operates the Santee Cooper Regional Water System on Lake Moultrie and the Lake Marion Regional Water System, two modern water treatment systems serving nearly 200,000 people, with plenty of room to grow. Launched on Oct. 1, 1994, the Santee Cooper Regional Water System expanded in 2017 by increasing capacity to 40 million gallons per day and again in early 2019, to 42 million gallons per day. The water system reflects a landmark partnership between multiple local jurisdictions and is a role model for public entity cooperation. The water system serves the Lake Moultrie Water Agency and its four members – Berkeley County Water and Sanitation, City of Goose Creek, Summerville Commissioners of Public Works and Moncks Corner Public Works Commission. An interior view of the Lake Marion Regional Water System. The water system serves the Volvo plant – one of the largest industrial assets in the state and Berkeley County. The system was declared ‘Best Tasting Water’ by the South Carolina Rural Water Association. The Lake Marion Regional Water System opened in May 2008 and is heralded for bringing clean, safe and reliable drinking water to counties along I-95, including some of the state’s poorest and most rural communities. The water system serves the Lake Marion Regional Water Agency and currently provides water to three agency members – Town of Santee, Calhoun County and Orangeburg County. Other members include Dorchester County and Berkeley County Water and Sanitation, that are served by system expansions. The system was also declared ‘Best Tasting Water’ by the South Carolina Rural Water Association. Santee Cooper plays a tremendous role in the economic development of South Carolina. We have supported industrial recruitment in all 46 counties of the state with loans, grants, facilities or other support. Santee Cooper and the South Carolina Power Team helped secure more than $15 billion in capital investment and 80,335 jobs across South Carolina since 1988. Santee Cooper industrial rates are 30 percent lower than the national average, which is critical in attracting and keeping industries and jobs. 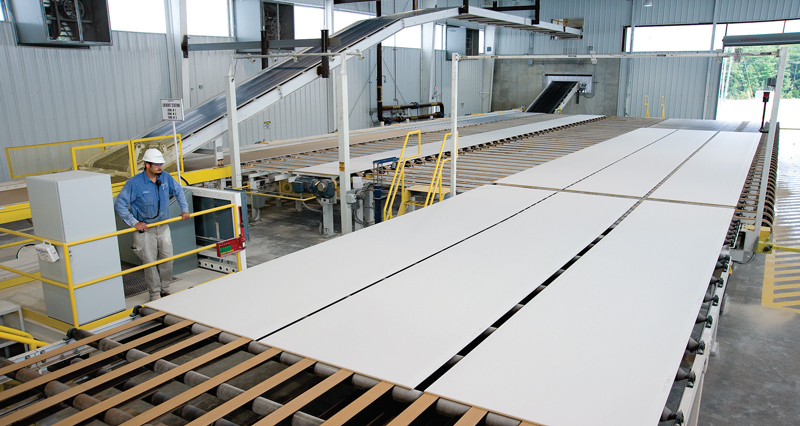 As an example of innovative industrial recruitment, in 2007 American Gypsum built a wallboard plant beside our Winyah Generating Station, to recycle gypsum – produced as a byproduct of our electrical generation – to make wallboard. 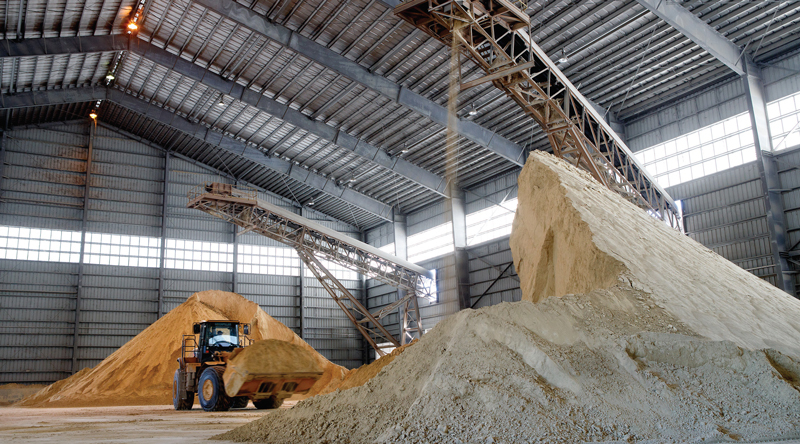 SEFA Group opened a new ash processing facility at Winyah Generating Station in 2014 and is recycling Santee Cooper fly ash and pond ash in products for the cement and concrete industries, a program that has attracted national attention. Santee Cooper was instrumental in creating the Charleston Regional Development Alliance after closure of the Charleston Navy Base in 1993. The CRDA continues to work today to strengthen regional employment and prosperity by recruiting leading global corporations, talent and entrepreneurs to the tri-county area of Berkeley, Charleston and Dorchester. We have contributed to the development of both inland ports, in Greer and in Dillon County, helping attract industry to those parts of the state. In 1995, Nucor Steel President Kenneth Iverson announced the new Berkeley plant at a press conference in the Santee Cooper auditorium. This was a $500 million investment that created hundreds of jobs. 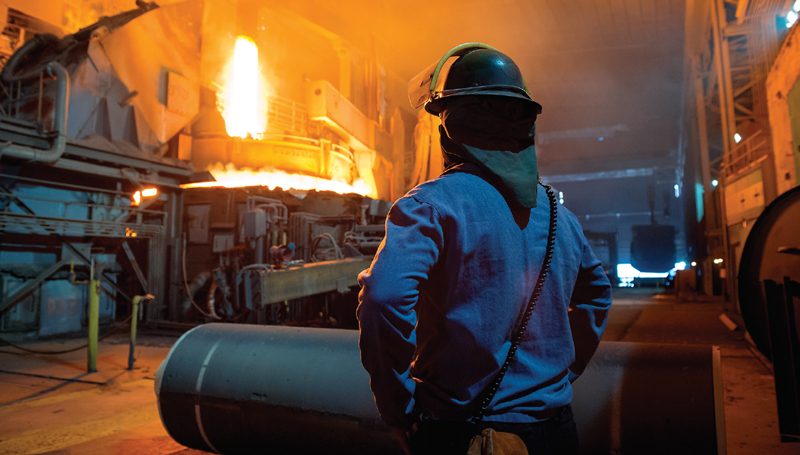 More than 20 years later, Nucor is Santee Cooper’s largest industrial customer. Nucor wanted Santee Cooper to provide the plant’s electricity and lobbied the General Assembly to change the service territory map to make that possible. The Nucor announcement led to a total of 10 additional industries (and two additional Nucor expansions) that announced facilities in Berkeley County from 1995 to 1998, with a total worth of $787 million and 1,125 new jobs. Berkeley had a $1 billion year (in economic development announcements) in 1995, which was the first time a county in South Carolina announced over $1 billion in economic development in a single year. A Nucor employee keeps an eye on electric arc furnace #2 as it begins the process of transforming 130-170 tons of scrap into liquid steel. In May 2015, then-Gov. Nikki Haley announced that Volvo would build its first North American car manufacturing plant in South Carolina. She credited Team South Carolina for the win, which included Santee Cooper, the South Carolina Power Team, Edisto Electric Cooperative, Berkeley Electric Cooperative, the South Carolina Department of Commerce, the State Ports Authority, Trident Technical College, and readySC, among others. Volvo has announced a total investment of more than $1 billion and plans to employ 3,900 people at the Berkeley County plant. Santee Cooper acquired the 6,800 acre-tract in 2015 as part of the effort that landed Volvo Cars USA in Berkeley County. Volvo is building its plant on part of that acreage. Some 4,000 acres remain, where Santee Cooper is developing a world-class center that will offer a unique opportunity for companies and their employees to merge commerce, community and convenience. The Atlantic Center Industrial Park is on the site of former Grove Manufacturing Co., which closed in 1984. Santee Cooper and Horry County bought the 272-acre property in 1987 and developed the commerce park and parcels. Once Santee Cooper recovered its investment, we transferred the remaining property to Horry County, which continued to develop the park. Metglas Inc., Frito Lay, Glendinning Products, Southeastern Paper Group and Chippewa Aerospace are just some of the park’s tenants. Teknoware, a leader in interior lighting systems for commercial vehicles and emergency lighting systems for public premises and ships, announced in November 2017 plans to locate here, claiming the last available acreage. Santee Cooper acquired the property, bought the land, funded improvements and announced plans to develop a commerce park there. The team used the Atlantic Center as a model for the 180-acre park. The Horry County State Bank office, Builders FirstSource, Carolina Food Services and Integra International are among the tenants. The Mount Holly Commerce Center, a 1,000-acre Class A facility and the first large-scale industrial park in the Lowcountry, reflects a partnership between Berkeley County, Alumax and Santee Cooper. It opened in October 1999. Santee Cooper paid for the construction and was paid back by Berkeley County over several years. Alumax provided land for the park, and it is served by Berkeley Electric Cooperative. In 2007, Google announced plans for a data center and became Mount Holly’s largest and most well-known tenant. After the federal government announced the Myrtle Beach Air Force Base closure in 1991, the state acquired the land and then-Gov. Carroll Campbell asked Santee Cooper to redevelop it. Santee Cooper facilitated environmental assessment and cleanup, dividing land and handling property transfers. The property now includes AVX Corp, more than 1,200 homes, parks and sports facilities, Horry-Georgetown Technical College, the International Culinary Institute of Myrtle Beach, the International Technology and Aerospace Park (ITAP) and The Market Common residential, business and retail community. The Santee Cooper lakes draw anglers from far and wide. 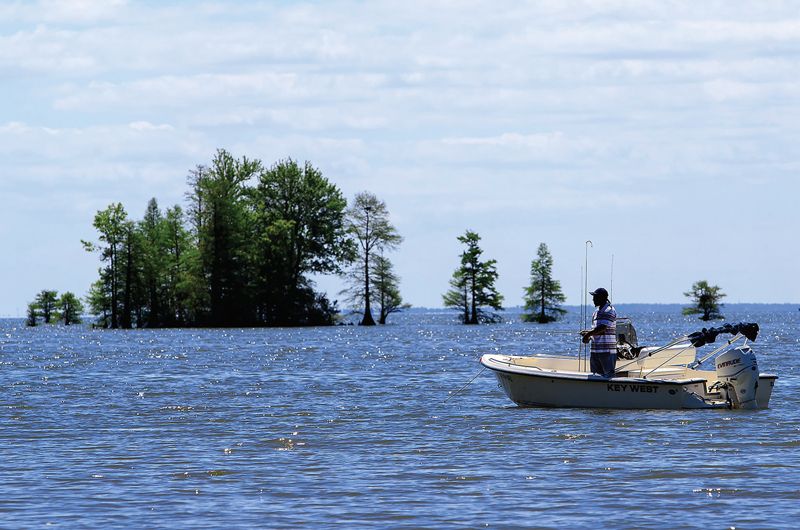 The result of impoundments for the Santee Cooper Hydroelectric Project, the Santee Cooper Lakes have also become a tourism magnet for fishing, hunting, water sports and other outdoor recreational opportunities. 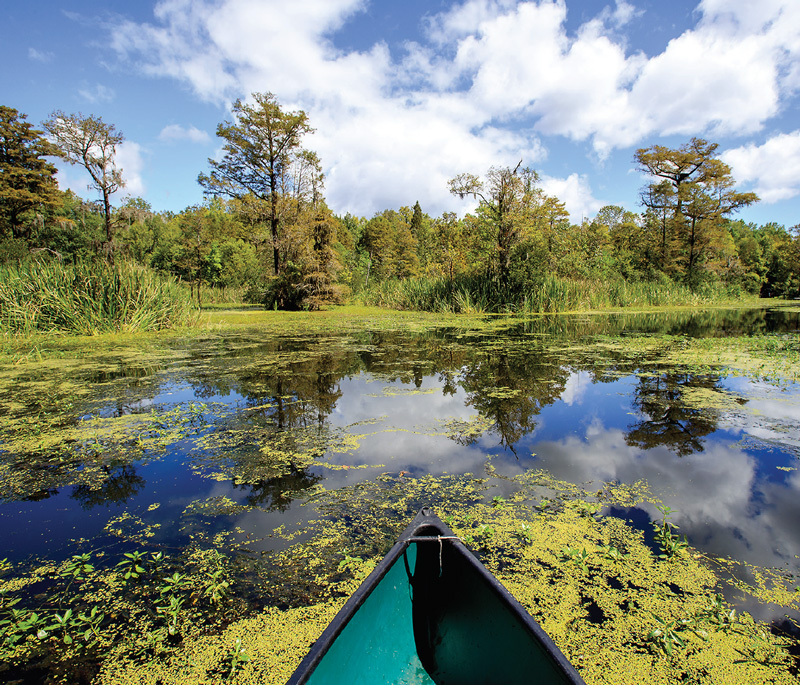 According to a 2017 study released by the South Carolina Department of Parks, Recreation and Tourism, tourism brought in $434 million to the ‘Santee Cooper Country’ counties (Berkeley, Calhoun, Clarendon, Orangeburg and Sumter). Santee Cooper Country tourism-related employment totaled 3,620 jobs with an annual payroll of $72 million. State and local tax receipts totaled $44 million that year. 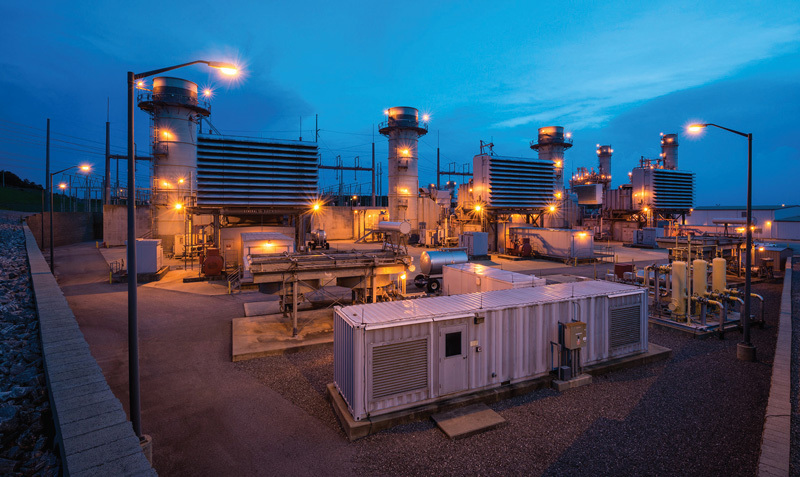 Santee Cooper introduced South Carolina utility customers to utility-supplied renewable electricity in 2001, when we opened South Carolina’s first Green Power Generating Station, capturing methane gas from a landfill and using it to generate electricity. Green Power is a part of Santee Cooper’s renewable generation portfolio, which today includes 106 MWs online or under contract including landfill gas, solar, wind and biomass. Santee Cooper also introduced solar power and wind power to the state’s electric grid, and we brought South Carolina its first community solar farm. In 2015, Santee Cooper generated its one millionth MWh of renewable Green Power from South Carolina landfill gas, solar and wind resources. 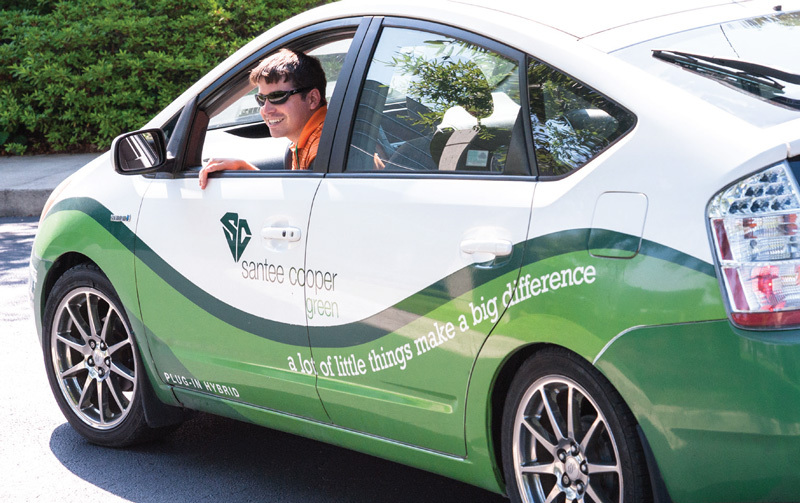 Santee Cooper sells Green Power to customers on a voluntary basis and reinvests proceeds into additional renewable generation and demonstration projects like Green Power Solar Schools and Myrtle Beach’s Grand Strand Solar Station. We are growing renewable generation through voluntary customer support. Santee Cooper's Green Power Solar Schools have provided solar panels to 28 schools across the state since 2007 and continue to engage 6th graders with a state-approved renewable education curriculum. In 2008, Santee Cooper launched our Solar Homes Initiative, the state's first rooftop solar program. It combined federal and state incentives with Santee Cooper incentives plus a zero percent interest loan, to promote rooftop solar to customers. Today Santee Cooper continues to offer rebates to customers who install solar on their home or business, and we purchase any excess energy customers may produce. 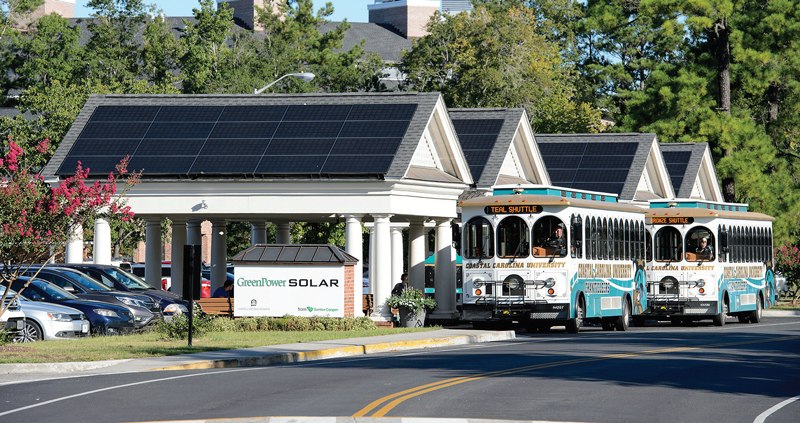 We donated solar canopies to the Technical College of the Lowcountry in 2010 as a demonstration project in partnership with Palmetto Electric Cooperative. In 2011, Santee Cooper built the 311-kW Grand Strand Solar Station, the state's largest solar array at the time. In 2014, Santee Cooper contracted for the 3-MW Colleton Solar Farm, the first utility-scale solar farm in South Carolina. Two years later, we launched South Carolina's first community solar program at Colleton Solar Farm. Santee Cooper brought our 2nd utility-scale solar farm online, the Bell Bay Solar Farm. Located on 10 acres outside Conway, the station features panels engineered to tilt toward the afternoon sun, to best match peak customer demand. Two new Santee Cooper solar farms, in Orangeburg and in Myrtle Beach, are under development and will open in 2019. Santee Cooper Green Power powers some of the state’s best-known sports events, including the PGA’s RBC Heritage Golf Tournament, NASCAR’s Bojangles’ Southern 500, and several NCAA football games. Santee Cooper was the first utility in the state to pursue onshore and offshore wind mapping, research and demonstration efforts, starting in 2005. Santee Cooper introduced wind power to the grid in 2010 when we dedicated a small wind turbine in North Myrtle Beach, part of our Wind Education Project designed to show the viability of wind power and promote awareness of it. The Santee Cooper Hydroelectric and Navigation Project was created to impound the Santee River, transform its power into electricity and spark prosperity in De-pression-ravaged rural South Carolina. 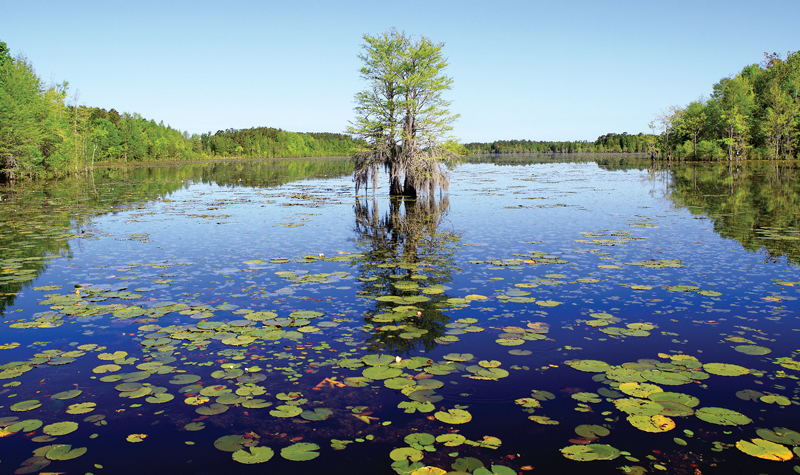 What was the largest earth-moving project in history resulted in the creation of Lakes Marion and Moultrie, 170,000 acres of natural paradise spanning sections of Berkeley, Calhoun, Clarendon, Orangeburg and Sumter counties. Lakes Marion and Moultrie are South Carolina’s largest freshwater resource, and Santee Cooper has worked to protect these reservoirs since they were completed in 1942. Maintaining the water quality is important to preserving the natural habitat and to ensuring a safe water source for Santee Cooper’s two water systems on the lakes. Managing the lakes is also important for area tourism: the lakes host attractions and draw events including the many major fishing tournaments held there each year. The Santee Cooper Lakes cover 170,000 acres in five counties and are bordered by 40 miles of dams and dikes maintained by Santee Cooper and 450 miles of shoreline. Santee Cooper analyzes monthly samples from 48 water quality monitoring stations and shares data with state and federal agencies. Santee Cooper actively works to control invasive weeds that, left unchecked, could block recreational and navigational ability on the lakes. These weeds include hydrilla, crested floating heart, water hyacinth and the newest invasive threat, giant Salvinia. Santee Cooper’s vector (mosquito) management program was the driving force in eliminating malaria from the area in the early 1950s. We continue efforts to control nuisance and disease-carrying mosquitoes today. This 195-acre historical and natural jewel in the heart of Moncks Corner features an Interpretive Center, theater and classroom, and hosts schoolchildren from across the Lowcountry for various field trips and educational seminars. Santee Cooper financed construction of Old Santee Canal Park, which opened in 1989, and we assumed ownership and operation of the park in 1999. The park offers environmental programs that emphasize the vast diversity of plant and animal life native to the area and found throughout the park. History and other educational programs offered include tours of the Stony Landing House, a circa-1843 farm house with a rich history entwined with the Lowcountry, and an Interpretive Center chronicling the area’s history as far back as 4000 B.C. The park hosts four miles of boardwalk and hiking trails along Biggin Creek and parallel to the Tailrace Canal. There is also a large floating dock that provides access and recreation to boaters, kayakers and canoers. Santee Cooper supports wildlife habitat management that increases plant diversity and enhances wildlife habitats. We use EPA-approved herbicides to control undesirable woody vegetation that can interfere with the delivery of electricity as well as invade natural wildlife habitats. Santee Cooper works with Heritage Trust Programs such as the Longleaf Pine Heritage and the Lewis Ocean Bay Heritage to ensure that the management of transmission rights of way crossing those preserves protects natural habitats. We work closely with the South Carolina Department of Natural Resources to manage the lakes and surrounding property, including more than 18,000 acres of fisheries and state wildlife management areas. Santee Cooper also supports the 15,000-acre Santee National Wildlife Refuge in Clarendon County. Since 1990, Santee Cooper has joined forces with S.C.U.T.E. (South Carolina United Turtle Enthusiasts) and other organizations to preserve and protect loggerhead sea turtles in Georgetown and Horry counties. 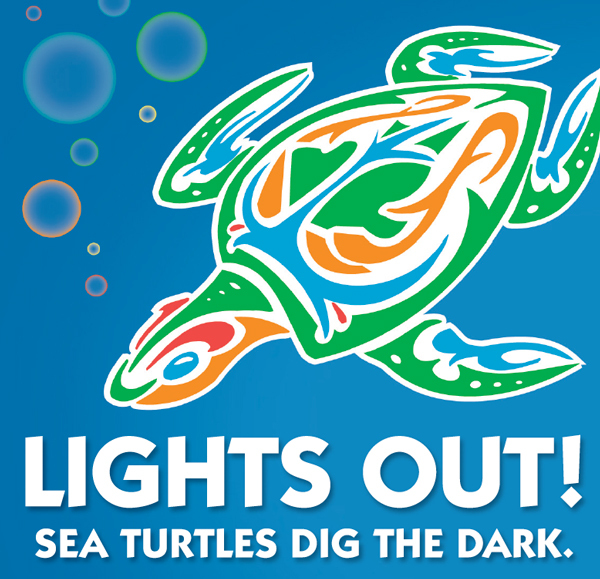 We raise awareness through public education programs, social media campaigns and signage placed on the beach that lets visitors know to turn off oceanfront lights after dusk, pick up trash and other items from the beach, and fill in holes. We provide free “Lights Out” bumper stickers to Grand Strand residents and visitors, helping to educate people about how to protect the state reptile. We also collaborate with property rental agencies to provide information about sea turtle protection to Grand Strand visitors at check-in. Scene from the Lake Moultrie Passage of the Palmetto Trail. The Palmetto Trail, stretching from the Lowcountry to the Upstate, is a hiking, biking and camping pathway enabling users to experience dozens of habitats and ecosystems throughout the state. Santee Cooper built 79 miles of the trail. 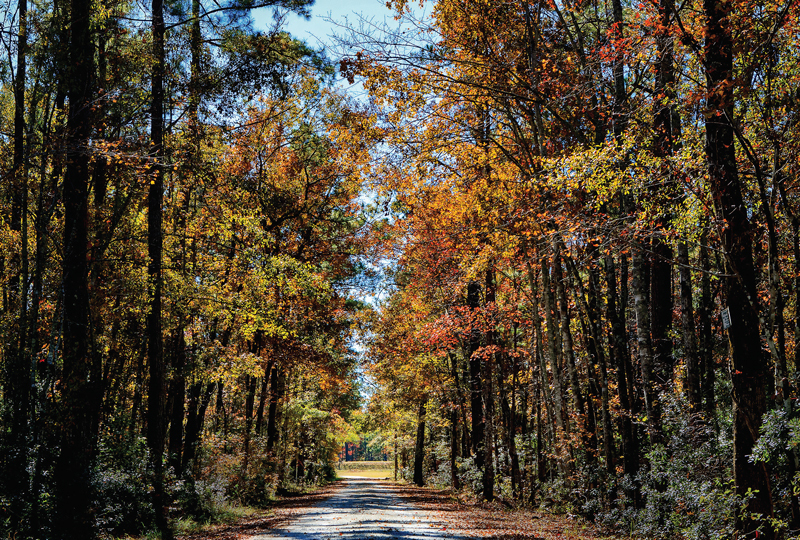 Santee Cooper built the trail’s first section, the 26-mile Lake Moultrie Passage, which opened in January 1996 and created widespread access for hikers and cyclists to some of the most beautiful vistas around the lake. Santee Cooper constructed two additional sections: the 20-mile Eutaw Springs Passage and the 33-mile Lake Marion Passage. Santee Cooper’s recycling initiatives have been widely recognized and continue to positively impact South Carolina. Santee Cooper is a former ‘Recycler of the Year’, named by the South Carolina Department of Commerce and South Carolina Recycling Market Development Advisory Council to recognize the utility’s efforts to recycle everything from used motor oil (and convert into electricity) to coal ash and office waste. In 1990, we worked with SC DHEC and started Give Oil for Energy Recovery (GOFER) to help South Carolinians dispose of used motor oil properly without threat to groundwater. Santee Cooper continues to collect used oil and recycle or reuse it to generate electricity. We’ve recycled more than 31 million gallons from all 46 counties of the state. Through this program, Santee Cooper has received numerous state and national awards. GOFER continues to be highly valued statewide. American Gypsum, a drywall manufacturer in Georgetown, uses our gypsum as a raw material for drywall. Gypsum that doesn’t meet the exact specifics for drywall is used by the local cement industry to produce cement. Santee Cooper’s gypsum is also licensed by Clemson for use as a soil amendment. This means that farmers in South Carolina can, and do, apply gypsum to their crops. It is especially valuable for peanut production. Gypsum stacks at Cross Generating Station (top), and American Gypsum (bottom). Santee Cooper has been recycling dry fly and bottom ash, produced as a by-product of coal generation, since the late 1970s. It is a valued raw material used in redi-mix and concrete products. 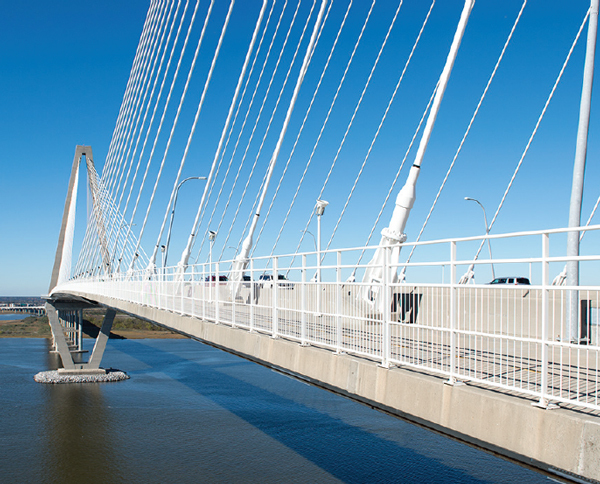 Santee Cooper’s fly ash has been used in many construction and road projects, perhaps most visibly Charleston’s Ravenel Bridge. More recently, we turned our focus to the ash ponds at our generating stations and developed a beneficial use program that has attracted national attention. Recovering and using pond ash requires some additional steps to make it useful to the cement and concrete industry. We have beneficially used more than 3 million tons of pond ash since launching this program in 2014. This program is environmentally beneficial because it removes the ash and recyclers encapsulate it. It is economically beneficial because it creates jobs and it provides manufacturers with a raw material. And it is a cost-effective way to handle our pond ash, which benefits our customers.